It is time for my friend Gary and me to bottle our Cabernet and the other night that is what we did. Our friend Lou came over to help and Guy Boleri, lounge sensation, serenaded us on the piano while we worked. Guy was in the living room right over our heads! We do our bottling in Gary's basement which was once a speakeasy during the 1980s for UB students. There is a bar down there and a menu over the bar offering sandwiches and beer. Gary has all this equipment including an old fashioned pliers-like implement that jams the corks into the bottles and seals them. Lou and I both practiced with that thing till we got good at it. In between working we sampled the new wine which tastes yummy! And I got to hear about Gary's and Lou's love lives. Gary is in love with a Hispanic chick so Lou being Hispanic was giving him advice on what to say and do. I just sat there and laughed unhelpfully. I love being the only woman in a houseful of guys on such occasions as this. I thought about how at Sacred Heart we used to sing this song. Lou is in love now too and he said that it is to the point where his love is returned. His lady friend is telling him, "I love you, baby." That is what he told me! In between these revelations the siphoning hose we were using for the wine turned into the All You Can Drink Wine Spigot. 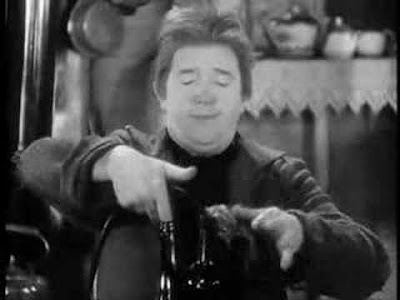 All I could think about were those Laurel and Hardy movies where Stan Laurel would be sitting there with the wine spigot in his mouth, getting drunker and drunker. Laurel and Hardy are my favorite comedians and they were Leonard Pennario's too. Naturally we discussed that, when we were supposed to have been talking about Ravel. Here is a picture of Stan Laurel bottling wine but it could just as easily have been me. Or Lou! We all agreed that our Cabernet is fine stuff. If you went into a restaurant and received a glass of it you would rejoice! It is not for nothing that I go in halves with Gary at James Desiderio's for the grape juice as I admitted in my list of important things about myself. That is a good move! We look forward to nights later this summer sitting in Gary's Florida room and drinking this wine and eating produce from Gary's garden. Gary is growing everything from wild garlic to Brussels sprouts to acres of tomatoes. And he let me taste his strawberries, just like in the song. He is also growing slender Japanese eggplant. This will be a magical summer. Please excuse my Appalachian dialect, but I know yall were a sight to behold, lol. You remind me of when I was a teenager and made some homebrew while my parents were away. It was bottled up too soon though and one night when they *were* home, it started exploding the bottles. They were in my Dad's old Army footlocker, hidden in my closet. Naturally, I was away at the time. Boy, did I ever hear about that one! Making alcoholic beverages runs in my family. When I was a young child at home in Harlan, KY, my Dad made 'moonshine' right behind the house. I used to spy on the 'men' drinking the still beer (mash) and it looked they were having so much fun, so I tried it one day. My first drunk. And I was only age five! Not only did I have a terrible hangover but I got a terrible whipping to boot! Your reminiscences made me remember when I was 17 and made mead. That is a honey beer as I am sure you know!! It blew up in my friend Lizzie's closet. I should ask her if she remembers that. What careers we have had!